The headset features a full 5 cameras for as large and reliable tracking as possible. 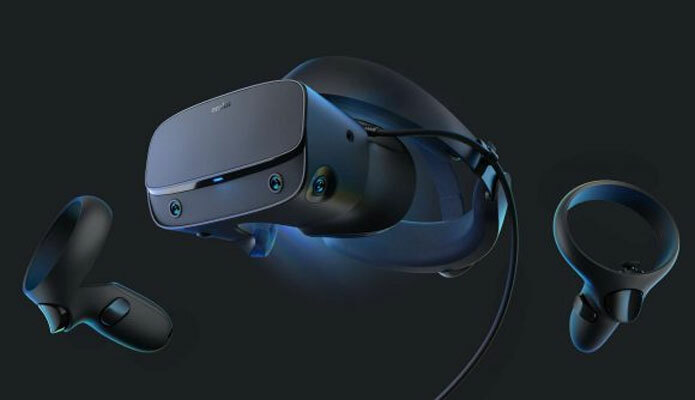 The Oculus Rift S is a Rift platform compatible headset that connects to peoples' PCs and doesn't require external sensors. Instead of on-ear headphones of previous iterations, the Rift S features near-ear speakers, but it includes a headphone jack for gamers to plug in their own headphones of choice. And while the Rift S is slightly heavier than the original Rift, the new Lenovo design is reportedly easier to wear for longer periods. There's been a small bump in resolution to 1280×1440 pixels per eye, though the frame rate of the displays is dropping from 90hz to 80hz. The Rift S has a higher-resolution display and self-contained tracking to go with their snazzy new design. The Quest's game library will differ due to the lower specs of the standalone headset; however, all Quest games will be playable on the Rift. The company has also introduced an all in one Oculus Quest which is set for a future Spring Release and will be priced for $399. "We're also enabling a true stereo-correct passthrough feature, Passthrough+". Consumers will have a choice between a high-powered, PC-connected headset with the Rift S and a more simplified headset that doesn't need to be tethered to a computer with the Quest. The Verge reports that Facebook will begin to phase out the original Rift when the Rift S launches. "Oculus Touch controllers, redesigned for inside-out tracking, bring familiar hand presence and input so you can grab, point, and gesture through the best of VR", said Oculus, explaining how the tech works. Will you be swayed by the Rift S? . Unfortunately, the Rift S doesn't seem to be much of an upgrade in that area, although it would be nice to be able to ditch my sensors and free up some USB ports. With those sorts of figures in mind, the new VR headsets from both Oculus and HP are created to tap into continued user interest in high-tech immersive gaming experiences. Hopefully, we'll know more after we get a chance to check it out in person.